Mount Huangshan is one of the most beautiful natural places you can visit in China. For millennia, Huangshan has inspired with its beauty poets and artists and it is not by chance that in many Chinese scrolls, we can see pictures of this mountain massif. Parallel to this, it is one of the best places for mountain tourism. Here the transitions are easy, natural beauty is astounding, and many identify it as a magic ride. Huangshan is located in the southern part of Anhui province in eastern China. This mountain range in the past served as the muse of traditional Chinese art and literature, but today the magnetic landscapes and sunsets are one of the most photographed images. Amazing views of granite peaks, trees and clouds in the sky cause mountains to be included in the UNESCO list of World Heritage Sites in 1990. Hunagshan was formed about 100 million years ago, the picturesque rock formations are the result of Quaternary glaciations during the Ice Age. Immortalized in Chinese scrolls and black and white drawings centuries ago, Hungshan is also known as Yellow Mountain. It was named that in honor of Emperor Huang Di, or the Yellow Emperor. Natural accents here are basically four - interesting forms of rocks, waterfalls, pine trees, grown directly on the rocks and a sea of clouds that surrounds the array. Huangshan has 36 points which rise to 1800 meters above sea level. Over the years many locales around the mountain were named by their physiological characteristics or after specific human acts. 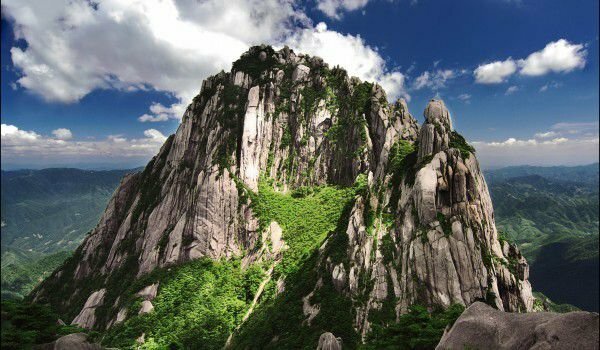 For example, one of the peaks is called Shixin, which translates roughly as "believe, after seeing". There is a story about a man who does not believe that Huangshan is as beautiful as many describe it. The man finally came and was satisfied that Chinese poets and artists are entitled to call it so. The mountain is a favorite spot for tourists because of the ease of transition and the ability to monitor the magical sunset or sunrise. It is especially beautiful from the Holy Mount, where in all seasons of the year, couples flock. Around 15 million tourists annually visit Huangshan. Along the mountain there are some interesting places to visit such as the ancient villages Xidi and Hongcun, which are also included in the UNESCO list of World Heritage. In 2002 even Huangshan Mountain had been declared-sister of the beautiful Jungfrau in the Swiss Alps. As a popular tourist destination, Huangshan is very well suited for picnics, hiking and mountain climbing. Since 1990, the mountain has about 50 kilometers of separate hiking routes, and today cable cars are built for tourists, that go from the base of Huangshan, to its top. In the beautiful peaks of the mountain is quite a lot of hotels and restaurants. In one of the most picturesque places in Huangshan are filmed many scenes from the movie "Crouching Tiger, Hidden Dragon."